Vikings were pretty out of this world, even for Medieval standards. Anthropologists studying Viking skeletons have revealed that many of them filed and probably painted their teeth, and we also know that they ironed their clothes with hot rocks, traveled with their spouses and had complex social interactions. Perhaps it’s time we rethink our image of classical Vikings. We’ve been writing quite a lot about Viking studies this week, and the main takeaway seems to be that the idea of huge brutes who just raped, pillage, drank and sailed is really not accurate. Although they did many raids and conquests Viking society mostly depended on agriculture and trade. They cared about their families, colonized with their spouses; about 50% of all Viking warriors were female. They also had a very strong sense of honor, both in battle and in the social system. The problem with the stereotypical view of vikings is that they got a lot of bad press – some 300 years of it. In fact, there is evidence that they actually weren’t more violent than other cultures at the time; but they did one big PR mistake: they pillaged churches. Now, don’t get me wrong – no one is saying the Viking society was a peaceful one – on the contrary. They were pirates and pillagers… like most societies at the time. They also traded slaves and were brutal warriors, showing little mercy to their enemies. They also practiced human sacrifice and took hallucinogenic drugs… but they also had a very strange sense of fashion. 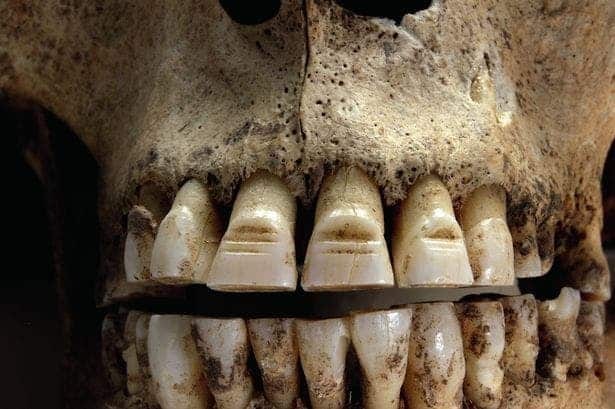 A Swedish anthropologist analyzed 557 Viking skeletons dating from A.D. 800 to 1050 and discovered that 24 of them bore deep, horizontal grooves across their upper front teeth. It’s the first time that dental modification (a practice found in many cultures around the world) was reported in Europe. Image credits: Stefan Lovgren, via National Geographic. “[These] unique finds of deliberate dental modification … reveal what we did not know before, that this custom is practiced around the world and also in Europe,” said Caroline Arcini, an anthropologist at the National Heritage Board in Lund, Sweden. Since no other European culture exhibited this practice and Vikings travel quite a lot, anthropologists believe they learned these techniques from other places. “Vikings are well known for their acquisitive habits, but until now we’ve thought of this in terms of gold, silver, and booty, not facial decoration,” said William Fitzhugh, a Viking expert at the Smithsonian National Museum of Natural History in Washington, D.C. The places where they were likely to learn this are West Africa and the Americas – places which we know the Vikings explored. 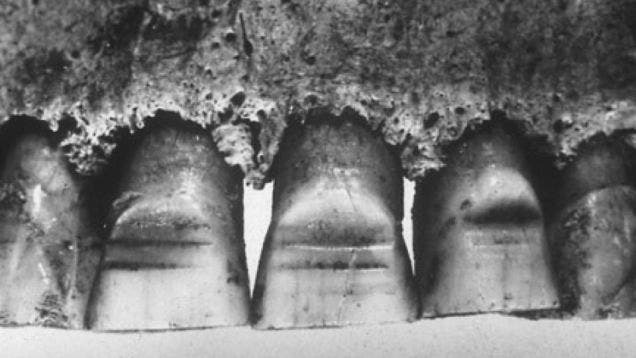 “However, African teeth modification was of a different sort, with teeth filed into points,” Fitzhugh said. So, through a process of elimination, they probably learned this in America. It’s not clear exactly why they did this, but it probably marked some type of achievement. It was both a symbol of pride and a way to scare enemies – because the teeth carvings were likely dyed (probably with red). This body modification probably made them even more terrifying. The marks are so well made that a person of great skill most likely filed them. “We do know that the Vikings took pride in their appearance, combed their hair, and ironed their clothes with hot rocks,” Fitzhugh said. [They] now seem to have taken pain to decorate their teeth. When in-filled with pigment, these grooves would have made Viking warriors look even more terrifying to Christian monks and villagers,” he added. The Trustees of the British Museum. Indeed, they may not have placed great value on how they smelled (though some records indicate that they washed more than Christians), but hair was very important for them. Combs are one of the most common finds in graves and there is significant evidence that indicates that Vikings took great care of their hair. 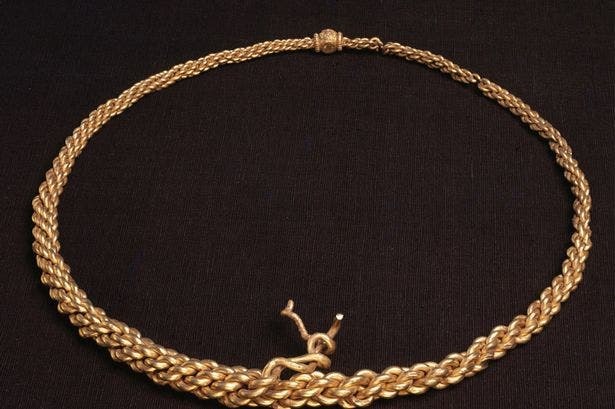 Vikings also liked to wear ridiculously big jewelry; one necklace from the exhibition measures 10 inches in diameter (25 cm) and weighs 4 lbs (almost 2 kilos).